Possibly in the collection of the Marqués de Salamanca [d. 1866], Madrid. Sir John Charles Robinson [1824-1913], London; (his sale, Hôtel Drouot, Paris, 7-8 May 1868, 1st day, no. 25); Sir Francis Cook, 1st Bt. [1817-1901], Doughty House, Richmond, Surrey; by inheritance to his son, Sir Frederick Lucas Cook, 2nd Bt. [1844-1920], Doughty House; by inheritance to his son, Sir Herbert Frederick Cook, 3rd Bt. [1868-1939], Doughty House; by inheritance to his son, Sir Francis Ferdinand Maurice Cook, 4th Bt. [1907-1978], Doughty House, and Cothay Manor, Somerset; sold May or June 1955 to (Margaret Drey, London); (Rosenberg and Stiebel, New York); sold 17 October 1955 to the Samuel H. Kress Foundation, New York; gift 1957 to NGA. Neil Maclaren, National Gallery Catalogues: The Spanish School, rev. ed. by Allan Braham (London, 1960), 27, fn. 27 (under no. 1457). In an 1895 letter in the archives of the National Gallery, London, Sir J. C. Robinson indicated that he had bought the version of the Expulsion now in London from the Marqués de Salamanca in Madrid "some 15 or 20 years ago". Because other evidence indicates that the London painting could not have been obtained in Madrid, Maclaren suggests that Robinson may have purchased the Washington version (which the baronet also once owned) from the Marqués de Salamanca. John Charles Robinson, Memoranda on Fifty Pictures, London, 1868: 38-41, no. 28. More than a dozen paintings from the Robinson sale went to Cook. To judge from annotated auction catalogues, some were bought outright, while others such as NGA 1957.14.4 were bought in and subsequently offered to Cook. Abridged Catalogue of the Pictures at Doughty House, Richmond, Belonging to Sir Frederick Cook, Bart., M.P., Visconde de Monserrate, London, 1903: 22, no. 5; Maurice Brockwell, Catalogue of the Paintings at Doughty House, Richmond, and Elsewhere in the Collection of Sir Frederick Cook, Bt., Visconde de Monserrate, London, 1915: 3:no. 495. See copies of correspondence in NGA curatorial files, from the Cook Collection Archive in care of John Somerville, England. A copy of the 17 October 1955 bill from Rosenberg & Stiebel to the Kress Foundation is in NGA curatorial files. Venetian Art, The New Gallery, London, 1894-1895, no. 182. Spanish Art, The New Gallery, London 1895-1896, no. 130. Spanish Old Masters, Grafton Galleries, London, 1913-1914, no. 116. Loan Exhibition of Pictures from the Cook Collection, The Holburne of Mentrie Museum, Bath, 1948-1951, no. 495, repro. Paintings and Sculpture from the Kress Collection, National Gallery of Art, Washington, D.C., 1956, 92-94, no. 34. El Greco of Toledo, The Toledo [Ohio] Museum of Art; Prado, Madrid; National Gallery of Art, Washington, D.C.; Dallas Museum of Fine Arts, 1982-1983, 78-80, 226-227, no. 2, pl. 12. El Greco: Identidad y transformación, Museo Thyssen-Bornemisza, Madrid; Palazzo delle Esposizioni, Rome; National Gallery and Alexandros Soutzos Museum, Athens, 1999-2000, no. 12, repro. (shown only in Madrid and Rome). El Greco: Themes and Variations, The Frick Collection, New York, 2001, pl. IV. El Greco: The Illumination and Quickening of the Spirit, The Metropolitan Museum of Art, New York; The National Gallery, London, 2003-2004, no. 6, repro., as The Purification of the Temple (shown only in London). El Greco: Painter and Master, Museo de Santa Cruz, Toledo, 2014, not in catalogue. The support is a single piece of poplar with horizontally oriented grain. It has a modern wooden cradle. A white ground of variable thickness was applied overall somewhat roughly. Most commentators have supposed that El Greco executed this painting in tempera. However, close visual examination suggests that the primary medium is oil due to the nature of the paint, its consistency, and the presence of numerous passages of resinous transparent glazes. Short, choppy strokes predominate throughout. Underdrawing for the architectural elements is partially visible through the paint film. Some of the outlines of the background architecture were incised in the white ground. The painting is in stable condition. The left edge of the panel is cut unevenly, and the adjacent composition looks chopped, suggesting that the composition has been cut down along the left edge and possibly the top edge as well. The ground and paint layers are damaged along the left edge, and there are additional small scattered areas of loss observed throughout. The blues and reds of the painting have lost their tonal balance. In contrast to the bright, stark blue drapery, the red drapery appears drab and washed out; the red pigment may have faded. The varnish is in fair condition; it is abraded along the left edge and penetrated by fine vertical fractures throughout. Willumsen 1927, 2: 275-281, seems to be the earliest source to claim that El Greco used tempera. This was also asserted by Camón Aznar 1950, 2: 1361, no. 82; Trapier 1958, 85; Wethey 1962, 2: 68, no. 104; Manzini and Frati 1972, no. 10a; Davies 1976, note to pl. 2; William B. Jordan, in exh. cat. Toledo-Madrid-Washington-Dallas 1982-1983, 226, no. 2. Eisler 1977, 191, no. K2127, described the technique as mixed. Robinson, John Charles. Memoranda on Fifty Pictures. London, 1868: 38-41, no. 28. Justi, Carl. "Die Anfänge des Greco." Zeitschrift für bildende Kunst 8 (1897): 182-184. Reprinted in Carl Justi. Miscellaneen aus drei Jahrhunderten spanischen Kunstlebens. 2 vols. Berlin, 1907: 1:217-218. Cook, Francis. Abridged Catalogue of the Pictures at Doughty House, Richmond, Belonging to Sir Frederick Cook, Bart., M.P., Visconde de Monserrate. London, 1903: 22, no. 5. Williamson, George Charles, ed. Bryan's Dictionary of Painters and Engravers. 4th ed. 5 vols. London, 1903-1904: 5:166. Thieme, Ulrich, and Felix Becker, eds. Allgemeines Lexikon der bildenden Künstler von der Antike bis zur Gegenwart. 37 vols. Leipzig, 1907-1950: 33(1939):5. Cossío, Manuel B. El Greco. Madrid, 1908: 76-81, 609. no. 349; pl. 7 bis (also 1972 rev. ed. : 39-40, 46-47, 359, no. 44, fig. 10). Calvert, Albert F., and C. Gasquoine Hartley. El Greco. London, 1909: 37-38, 46. Mayer, August L. El Greco. Munich, 1911: 22-24, 83, repro. 23. Bertraux, Emile. "L'exposition espagnole de Londres." Gazette des Beaux-Arts 11 (1914): 254-255. Beruete y Moret, Aureliano de. "Exposition d'anciens maîtres espagnols à Londres." La revue de l'art ancien et moderne 35 (1914): 65. Brockwell, Maurice. Catalogue of the Paintings at Doughty House, Richmond, and Elsewhere in the Collection of Sir Frederick Cook, Bt., Visconde de Monserrate. 3 vols. London, 1915: 3:131, no. 495, pl. 17. Mayer, August L. Dominico Theotocopuli, El Greco. Munich, 1926: 10, no. 49, pl. 3. Willumsen, Jens Ferdinand. La jeunesse du peintre El Greco. 2 vols. Paris, 1927: 2:275-290, pl. 50. Villar, Emilio H. del. El Greco en España. Madrid, 1928: 81, pl. 1. Rutter, Frank. El Greco. New York, 1930: 3, 16-17, 89, no. 4, pl. 3. Waterhouse, Ellis K. "El Greco's Italian Period." Art Studies 8 (1930): 70, 85, no. 5. Mayer, August L. El Greco. Berlin, 1931: 13, 26-31, fig. 13. Brockwell, Maurice W. Abridged Catalogye of the Pictures at Doughty House, Richmond, Surrey, in the Collection of Sir Herbert Cook. London, 1932: 29, no. 495. Legendre, Maurice, and Alfred Hartmann. Domenikos Theotokopoulos Called El Greco. Paris, 1937: 158, repro. Goldscheider, Ludwig. El Greco. London, 1938: pl. 5 (also 1954 rev. ed. : pl. 5). Harris, Enriqueta. 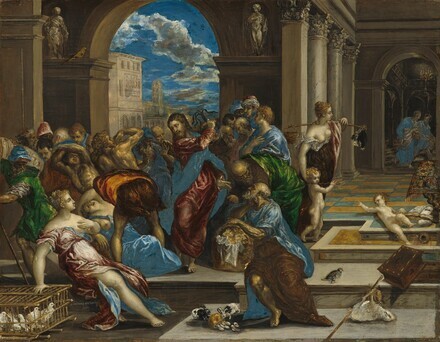 El Greco: The Purification of the Temple. The Gallery Books 2. London, 1943: 7-12, figs. 3, 8. López-Rey, José. "El Greco's Baroque Light and Form." Gazette des Beaux-Arts 24 (1943): 75-76, fig. 1. Palluchini, Rodolfo. "Some Early Works by El Greco." The Burlington Magazine 90 (1948): 133. Camón Aznar, José. Domenico Greco. 2 vols. Madrid, 1950: 1:62-66, fig. 40; 2:1361, no. 82 (also 1972 rev. ed., 1:80-84, 133, fig. 46; 2:1342, no. 85). Paintings and Sculpture from the Kress Collection Acquired by the Samuel H. Kress Foundation 1951-56. Introduction by John Walker, text by William E. Suida and Fern Rusk Shapley. National Gallery of Art. Washington, 1956: 92-95, no. 34, repros. 93, 95. Walker, John. "The Nation's Newest Old Masters." The National Geographic Magazine 110, no. 5 (November 1956): 631, color repro. 633, 634. Shapley, Fern Rusk. Comparisons in Art: A Companion to the National Gallery of Art, Washington, DC. London, 1957 (reprinted 1959): pl. 38. Wittkower, Rudolf. "El Greco's Language of Gestures." Art News 56 (March, 1957): 54, repro. 48. Gaya Nuño, Juan Anotonio. La pintura española fuera de España; historia y catàlogo. Madrid, 1958: 187, no. 1193. Trapier, Elizabeth du Gué. "Greco in the Farnese Palace, Rome." Gazette des Beaux-Arts 51 (1958): 78, 83-85. Paintings and Sculpture from the Samuel H. Kress Collection. National Gallery of Art, Washington, 1959: 268, repro. MacLaren, Neil. National Gallery Catalogues: The Spanish School. Rev. ed. by Allan Braham. London, 1960: 24-27, under no. 1457. Sánchez de Palacios, Mariano. El Greco. Madrid, 1961: 112. Walker, John, Guy Emerson, and Charles Seymour. Art Treasures for America: An Anthology of Paintings & Sculpture in the Samuel H. Kress Collection. London, 1961: 131, color repro. pl. 123. Cairns, Huntington, and John Walker, eds., Treasures from the National Gallery of Art, New York, 1962: 42, color repro. Pavon, B. "El Greco arquitecto." Archivo Español de Arte y Arqueologia 35 (1962): 209-214. Wethey, Harold E. El Greco and His School. 2 vols. Princeton, 1962: 1:21-23, figs. 3, 363,; 2:66-68, no. 104 (also Spanish ed. Madrid, 1967: 1:40-41, pls. 3, 363; 2:81-83, no. 104). Walker, John. National Gallery of Art, Washington, D.C. New York, 1963 (reprinted 1964 in French, German, and Spanish): 160, color repro. 161. Xydis, Z. G. "El Greco's `Healing of the Blind.'" Gazette des Beaux-Arts 64 (1964): 303-304, fig. 6 (detail). The Italian Heritage. Exh. cat. Wildenstein & Co. New York, 1965: under no. 43. Cairns, Huntington, and John Walker, eds. A Pageant of Painting from the National Gallery of Art. 2 vols. New York, 1966: 1:196, color repro. The Frick Collection: An Illustrated Catalogue. 2 vols. Princeton, 1968: 2:314, 316-317, under 09.1.66. Manzini, Gianna, and Tiziana Frati. L'opera completa del Greco. Milan, 1969: no. 10a. Gudiol y Ricart, José. Domenikos Theotokopoulos, El Greco. Translated by Kenneth Lyons. New York, 1973: 21, 339, no. 8, figs. 9-10, color fig. 11 (also 1983 ed. : 21, 339, no. 8, figs. 9-10, color fig. 11). Davies, David. El Greco. London, 1976: 6, 11, note to pl. 2, color pl. 2. Pérez Sánchez, A. E. The Golden Age of Spanish Painting. Exh. cat. Royal Academy of Arts. London, 1976: 30, under no. 6. Eisler, Colin. Paintings from the Samuel H. Kress Collection: European Schools Excluding Italian. Oxford, 1977: 191-194, figs. 194, 197, as The Expulsion of the Moneychangers from the Temple. Puppi, Lionello. "Il soggiorno italiano del Greco." Studies in the History of Art 13 (1983): 143. Davies, David. "El Greco and the Spiritual Reform Movement in Spain." Studies in the History of Art 13 (1984): 63, fig. 1. Walker, John. National Gallery of Art, Washington. Rev. ed. New York, 1984: 234, no 300, color repro. Wethey, Harold E. "El Greco in Rome and the Portrait of Vincenzo Anastagi." Studies in the History of Art 13 (1984):172, repro. Brown, Jonathan, and Richard G. Mann. Spanish Paintings of the Fifteenth through Nineteenth Centuries. The Collections of the National Gallery of Art Systematic Catalogue. Washington, D.C., 1990: 67-72, color repro. 69. El Greco of Crete: Exhibition on the Occasion of the 450th Anniversary of his Birth. Exh. cat. Iraklion, 1990: 304-307, fig. 1, 399-400. National Gallery of Art, Washington. National Gallery of Art, Washington, 1992: 79, repro. Gibson, Sarah S. and Paul Grimley Kuntz." In Encyclopedia of Comparative Iconography: Themes Depicted in Works of Art. 2 vols. Edited by Helene E. Roberts. Chicago and London, 1998: 1:305. Nygren, Edward J. “Money." In Encyclopedia of Comparative Iconography: Themes Depicted in Works of Art. Edited by Helene E. Roberts. 2 vols. Chicago, 1998: 2:620. Danziger, Elon. "The Cook Collection: Its Founder and Its Inheritors." The Burlington Magazine 146, no. 1216 (July 2004): 447. Frankfort, Enriqueta Harris, translated by Nigel Glendinning. "El Greco's 'Fortuna Critica' in Britain." In Spanish Art in Britain and Ireland, 1750-1920: Studies in Reception, In Memory of Enriqueta Harris Frankfort. Edited by Nigel Glendinning and Hilary Macartney. London, 2010: 246, fig. 55, color pl. 16.